Nametags should be worn at all times. Admission to dining hall may be denied without a nametag. Quiet time is set at 10 P.M. in order to comply with a county noise ordinance and Seabeck rules. Be especially courteous around housing areas, including the Inn porch. Loud personal stereos are discouraged at all times. Specific areas will be designated for late evening social activities. Do not remove any items of bedding, any chairs, other furniture, or Seabeck equipment from any room without the permission from the Seabeck Executive Director. Individuals at camp may not sell products or services due to Washington state tax laws. Motor vehicles are to be driven only on roads and only to transport people and equipment. Vehicles may be parked only in designated areas. If you expect to leave the grounds for an extended time, please inform the Dean and/or the Eliot Registrar by using the "Leaving Eliot Log" to sign out. If you have children enrolled, please also inform the Children’s Director. In order to keep everyone healthy at Eliot camps, if you have been ill, please delay arriving at camp until you've been symptom-free of vomiting, diarrhea, and fever for 24 hours. For camp leaders to respond quickly to a possible viral gastrointestinal outbreak at camp, campers should let the First Aid Team know if they develop any vomiting or diarrhea during camp. To prevent the spread of a gastrointestinal outbreak during camp, good hand washing before eating, after using the bathroom, and when hands are dirty can't be encouraged enough. Persons who are of legal age for smoking and drinking are reminded that young campers view them as role models. They are encouraged to restrict their smoking and drinking behavior during camp. No illegal drugs or paraphernalia. Drug use or underage (21) drinking will result in immediate expulsion from camp. Prescription and over-the-counter drugs must be kept in original containers. Although a 2012 law decriminalizes marijuana in Washington, marijuana remains classified as an illegal drug under federal law. Also, Seabeck Conference Center is private property with its own rules prohibiting the use of pot. Marijuana is not allowed on conference grounds, period. Alcohol is permitted only in a camper's room or at designated social events. Alcohol may not be left unattended in public areas. Users should properly recycle empty containers in Seabeck’s recycling bins. It is illegal for anyone under 18 to smoke in Washington. No smoking in buildings or woods by anyone. Waterfront activities are offered during summer conferences. Waterfront is closed otherwise. Swimming is only allowed in the designated swim area and when the lifeguard is present. No swimming after dark. A child is required to use a "swim diaper" while in the lagoon if the child is still using diapers. No child under age 6 or who has not passed the swim test should be left at the lagoon unattended by a directly supervising adult (other than the lifeguard). All campers under age 18 must have a "Swim-Buddy," and always be aware of this buddy's whereabouts while in the swimming area. 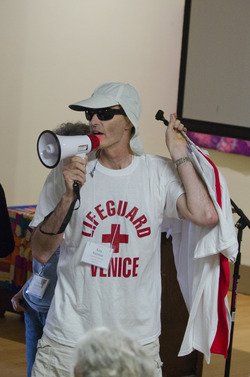 When the emergency air horn is heard, all swimmers must get out of the water, and health professionals at Eliot should report to the waterfront. The boats may be used only when the boat dock is "open" and under the supervision of the boat dock volunteer. All boaters under age 18 must wear life jackets. Adults are strongly urged to wear life jackets also. Campers under 18 years old who haven't passed the boating test must be accompanied in the boat by an adult or someone who has passed the boating test. Boats must stay out of the swimming area. No swimming from boats. No candles or other burning matter should be used in any building or the woods, with the exception that we are allowed to light chalices, in appropriate containers, during our all-camp worship services and during the morning Youth Program. A supply of water and/or a fire extinguisher must be kept nearby. The Worship Coordinator must be informed of all candles planned for worship services. No fireworks or firearms at Seabeck. This era of digital file-sharing poses a challenge for our special community. Many of us give ourselves permission while at Eliot to try new things, stretch in new directions, and risk unfamiliar behaviors. This is one of the joys of what we create together. At the same time, not all of us are comfortable sharing these brave acts beyond Eliot. Posting of photos and videos can, easily and inadvertently, result in embarrassment or other negative consequences. In an attempt to balance this need for privacy with the desire for continued fun and connection, Eliot has a policy about image sharing. This is: DUWOP – Don’t Upload With-Out Permission. Before posting a photo or video of any camper to the Internet (or transmitting it via cell phone), you must first obtain permission from the subject; for those under 18 years of age, you must obtain permission from the parents. Ask Dean in advance for approval. Notify Registrar for day-use fee payment and visitor nametag. Visitors may not attend Eliot programs, events, or meals. Nor may they stay overnight.